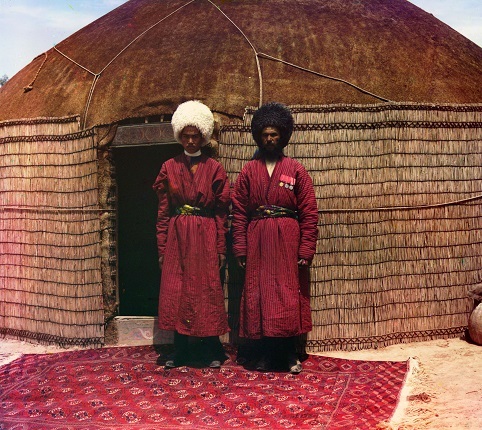 Two members of SCP-3838-3, posing in front of a rug which they had woven, 1908. Special Containment Procedures: A perimeter is to be established 1km away from SCP-3838's area of operation. A single entrance is located on the eastern edge to allow entrance and egress to and from the area of operation and the research base. To prevent incursions by SCP-3838-4, the perimeter is heavily armed against both internal and external threats. SCP-3838-4's activities are currently limited to occasional raids on the other SCP-3838 instances, but conversations with members of the other SCP-3838 instances indicate that SCP-3838-4's occupation is currently due to begin in 2054, with a strong likelihood of this occurring at an early date due to SCP-3838-4's military strength and aggressive behaviour. Efforts to engage SCP-3838-4 diplomatically are underway, but this should not be done at the expense of the Foundation's relationship with SCP-3838-3. Internal disputes or conflicts between SCP-3838 instances are not to be interfered with. There are, however, two exception to this rule: 1) if said conflicts may cause a containment breach, or 2) if any conflict occurs between SCP-3838-4 and either SCP-3838-2 or SCP-3838-3, as per our agreement with these groups. Any members of SCP-3838-8 are to be detained and interrogated upon sight. No such members have been encountered thus far. Description: SCP-3838 refers to a series of 8 nomadic Turkmen tribes. These tribes all occupy a space of 10km2 at a site in western Turkmenistan, near the Caspian Sea. However, these tribes possess an ability to travel through time, and thus each SCP-3838 instance occupies the land at a different point in history. SCP-3838 instances treat different periods of time as if they are different areas of territorial pastureland owned by one tribe or another. Agreements and conflicts over the periods owned by each tribe are common, with sudden raids into a particular time period common. Two time periods have been set aside for particular common purpose, under which there is an agreed-upon parley between the tribes: an unspecified period in the early 15th century BCE, and the period from 1800-1858, used as a marketplace and as a place for inter-tribal councils and gatherings. SCP-3838 instances travel through time through an unknown ritual, which is not shared with outsiders. It is known that this involves the travellers entering a ger1, with two flames flanking the entrance, but nothing else about the process has been conclusively determined. SCP-3838 instances do not occupy their time period contiguously, but ordinarily move to a different time within their period, forwards or backwards, every six months. The continual raiding, conflict and re-use of already used years has resulted in a number of temporal paradoxes occuring; these have not, however, caused any significant temporal destabilities, due to an unknown method of temporal preservation. The culture of SCP-3838 is typical of nomadic tribes of the region. They primarily live in gers, and each tribe is ruled by a khan, despite the small sizes of each group. They all speak the same antiquated dialect of Turkmen, believed to have been common in the region during the 15th century; some also speak Persian and Chagatai, with a small number possessing knowledge of classical Arabic. SCP-3838 instances often practice a fusion of traditional and Islamic beliefs, with some exceptions (detailed below). Economically, SCP-3838 instances primarily live off the milk and meat of goats and sheep, with a natural spring located within the bounds of their physical territory providing water. A large number of handicrafts are created by the SCP-3838 instances; this is often the role of the women, although the traditionally egalitarian nature of nomadic societies also affords them a limited role in herding, rearing, combat and sometimes tribal leadership. The exception to this is SCP-3838-2, which is a solely matriarchal tribe. Of note is the possession of large quantities of advanced technology and weaponry possessed by all of the SCP-3838 instances. These have reportedly been raided or traded from tribes whose "territory" is in the future. SCP-3838-3 is the current SCP-3838 instance occupying the pastureland. The Foundation has promised protection for SCP-3838-3 against SCP-3838-4, a hostile tribe seeking to aggressively expand its "territory" into the 21st century. In exchange, SCP-3838-3 voluntarily offers the Foundation advanced technology which the Foundation believes may be useful. The Foundation has a similar arrangement with SCP-3838-2, although as their "territory" is now in the past, this agreement is rarely activated in modern times. Communication with the tribes is difficult, as the Foundation encounters them at wildly different points in their personal timelines and often recieve contradictory information as a result, a problem exacerbated by the continuous rewriting of the timeline. SCP-3838 was first discovered in 1696, when the Foundation predecessor organisation Devan-e Jaaduyih (Office of Magic), a part of the Safavid governmental apparatus which would later become an independent organisation, responded to reports of "disappearing and reappearing tents" by relocated Kurdish tribesmen in the area. The Devan-e Jaaduyih continued to contain the tribes until its absorption into the Foundation in 1834. The anomaly itself is believed to have started in the 15th century BCE, following a "vast battle"; they have, however, been heavily influenced by later Turkic and Islamic nomads, and their oral history contains few reliable elements from before the 1st century CE. Below are details of all of the SCP-3838 tribes, their zones of control, and the nature of the two parley zones. Note that some of this information was recorded during earlier periods of the Foundation's history, and that of their predecessors, when social attitudes and data gathering were performed under markedly different standards. The "Holy Years" c. 15th century BCE Within the variant of Tengri beliefs practised (often syncretically with Islam) by SCP-3838, these years are considered to be a particularly holy site, where a great conglomeration of spirits gather. It is believed that a great battle occured shortly before the beginning of these years, but there is uncertainty as to its nature. SCP-3838-1 c. 110 CE to c. 290 CE Little is known about this tribe; they were only observed in the "Marketplace" years. They are rumoured to produce particularly fine earthenware pots, and these were often seen in the marketplace. Unusually, they appear to follow strong Manichean beliefs, but associated "darkness" in Manichean dualism with the colour red. SCP-3838-2 c. 1130 CE to 1799 CE A matriarchal tribe; combat, herding and tribal leadership are solely the preserve of women. This unusual arrangement is credited to a "hero" during the ancient battle mentioned earlier. Their unusually large territory is a mark of their particular success as a tribe. Information on this tribe is scant, and filled with exaggeration and myth by earlier writers; it is known, however, that they were skilled hunters who often ranged further afield than the other tribes, engaging in the Mongol tradition of the nerge2. They practice a mixture of shamanism and Islam. The "Marketplace" 1800 CE to 1858 CE A place of pre-agreed upon gatherings. Tribes often arrive here to trade technology and talismans, as well as to arbitrate disputes. SCP-3838-4's hostility has resulted in their exclusion from this period; SCP-3838-8 instances are never seen. A description by Foundation operative Ali Quli Beg describes the ware on offer as "strange and terrible things; muskets and rifles altered to emit bolts of light, pagan talismans which glow with strange fire, an antique funeral urn with shifting markings, and arrows which followed their targets like hounds." SCP-3838-3 1870 CE to 2054 CE The current tribe. SCP-3838-3 is ruled by a khan in consultation with several begs, perhaps mirroring the traditional position in the region of a khan being a senior governor and a beg being a lesser governor. Members of SCP-3838-3 are known for the particular quality of their carpet-weaving, which they often use as objects of bartering. They formerly held many more years, but have been pushed back by SCP-3838-4. SCP-3838-4 2054 CE to c. 3000 CE The largest known tribe in terms of time occupied, SCP-3838-4 is shunned by and hostile to other tribes and to the Foundation. They are often dressed in human skins, although captured members claim that these are only the skins of SCP-3838-8 members. Nevertheless, this practice has led them to be abhorred by the other tribes; the only exceptions are the SCP-3838-7 survivors, who have a good relationship with SCP-3838-4. They are reportedly obsessed with SCP-3838-8 and are attempting to create an "empire of time" to stand against them. They often enslave or incorporate other tribes into their own. They are known for their protection of a particular funeral urn, which houses the body of a "fallen foe". Interestingly, oral tradition among SCP-3838-2 includes a reference to an "ancient urn", and older survivors of SCP-3838-7 have talked of "losing their urn". SCP-3838-5 c. 3000 to c. 3020 CE A small tribe, SCP-3838-5 has been almost wiped out. Its members are renowned for their skill at cooking, and could be found in large numbers at the marketplace and sometimes within other tribes. Reportedly, they are running low on good pastureland, and "constantly meet themselves" within the tiny size of their remaining territory. SCP-3838-6 c. 3020 CE to c. 3450 CE Traditional allies of SCP-3838-5, SCP-3838-6 possess particularly advanced technology often found at the Marketplace. SCP-3838-6 are known for their lack of syncretism, practising a relatively pure form of Shi'ite Islam. They are known to have dealings with a group calling themselves the "Empire for the Reclamation of Islamic Artifacts", believed to be a future variant of the ORIA; they are, however, extremely friendly and co-operative with the Foundation despite this. SCP-3838-7 None; formerly c. 3500 CE to c. 4100 CE This tribe was destroyed; surviving members and their descendants can occasionally be found in other tribes and at the marketplace, although most were incorporated into SCP-3838-5. Although the other SCP-3838 instances ascribe this destruction to SCP-3838-4, surviving SCP-3838-7 members claim it was done by SCP-3838-8. SCP-3838-8 Unknown; in the far future. Very little is known of this tribe; no members have ever been encountered, and the other SCP-3838 instances ordinarily refuse to speak of them outside of their oral tradition, which states that they were the tribe fought against at the "great battle" (although other sources state that it was a single powerful figure who was fought against; both traditions are believed to have been created well after the event). The only exception is SCP-3838-4, who refers to them as the "enemy above all enemies" and the "rejectors"; limited contact with SCP-3838-4 has prevented the Foundation from learning more, however. Addendum 1: On 02/01/2011, a member of SCP-3838-4 approached the research base attached to the perimeter defences. Claiming to be an envoy, the figure asked for an interview with the site director, which was granted; a transcript can be found below. Interviewer: Dr. Sayyeda Aisha Rizvi, Site Director. Interviewee: An envoy from SCP-3838-4. Dr. Rizvi: Look, tell me what you want. You're lucky we've even granting you this interview. Envoy: We have met your kind before. You'll understand my… hesitancy in trusting you, khanum. You capture our people, kill our soldiers. We do not easily forget. Dr. Rizvi: You kill ours. You kill our friends among the tribes. Envoy: Oh, what is the point of this? I could tell you we have a purpose, I could tell you we have a purpose behind our raids, that I take no joy in the killing of our brothers, but to what end? It would convince you of nothing. Let us stick to the matter at hand. Dr. Rizvi: Go on, then. What was it you wanted to dicuss? Envoy: What do you know of the battle? The great battle that defined our world? Envoy: It matters little. Let me find another way to put it… imagine we made a prison. Dr. Rizvi: I didn't think you went into that kind of thing. Envoy: A prison, but one of many aspects. If you want to truly lock something away, you make its substance uncertain. You trap part of it in another reality, another in a different concept of existence- and another in a pocket of time. Dr. Rizvi: …Something is being imprisoned by you? Dr. Rizvi: I'll need more than that. Envoy: And I cannot give it to you, Khanum. We have nine centuries of time to look after, pastures and children and womenfolk. Our years are good, and vast, and we protect our own. Nobody else remembers. They all forget. They see us only as bloodthirsty tyrants. They all forgot! And now we stand alone. The seventh tribe were the only others, and they died. We need help. You contain things, yes? You keep them hidden? Envoy: No. We cannot. I am sorry. Dr. Rizvi: Then we cannot make a deal. Envoy: Look, I- you can stand on your principles all you like, but this is happening, khanum. The Eternal Heaven has orchestrated this. If we told you, we would be breaking our promise. We made a pact. We will not bend. And if you do not, then it will be released. Dr. Rizvi: …What do you want from us, then? Envoy: To talk. To have you as an intermediary, for they will not trust us. We cannot unite the tribes, so we must join with them. Please, khanum. Please help us. The envoy is visibly shaking at this point. Envoy: You don't, khanum. But you are the Jailors. You are the ones who keep us safe. Everyone safe. From the dark behind the eyes. A pause for five seconds. Dr. Rizvi: Alright. Come with me. There are some people you should speak to. Following this, SCP-3838-4 has agreed to stop its program of aggressive expansion against the other SCP-3838 instances. SCP-3838-4 has refused to elaborate further on the nature of SCP-3838-8, but the Foundation has agreed to support its efforts at political alliance and communication with the other SCP-3838 instances, as it is believed the nature of the threat described is serious enough to warrant precautions. They forget the hallowed words upon the death of time. One of many old chanyus3 forgotten in this way. They shall not forget again before my flaming crown. Such loveliness is lost upon the children of the urns. Only one remembers and is not bent to my will. And ere the end of all your days the Crimson Khan shall ride. 1. Often called a yurt, a ger is a type of tent used by the nomadic peoples of Inner Asia. 2. A type of ceremonial hunt, wherein the hunters encircle an animal together before firing upon it. 3. A term used for the leader of a steppe tribe before khan.